James Van Praagh - Are Your Loved Ones In Spirit Trying To Tell You Something? James Van Praagh talks about after death communication. Bob Olson, Afterlife TV: Hi everybody. This is Bob Olson with Afterlife TV. We’re at afterlifetv.com, and we’re here; once again, we are honored to be able to interview the celebrity medium James Van Praagh. He has a great sense of humor. I love interviewing you, excellent answers. Thanks so much for coming back, James. James Van Praagh: Thanks, Bob. I appreciate it. I feel like I’ve been with you the whole day. It’s pretty amazing. Bob Olson, Afterlife TV: I know. James Van Praagh: Thanks very much, anytime, anytime. Bob Olson, Afterlife TV: It’s crazy. Well anyways, we always have fun when we get together. Today we are going to talk about are your loved ones in spirit trying to tell you something. I’m going to allow this to go in any direction that it wants to go today. I have a feeling it might follow some interesting directions. But first of all, I’ll just ask you this silly question: Are our loved ones in spirit trying to contact us, James? James Van Praagh: Yes, more than likely they are, Bob. Bob Olson, Afterlife TV: Yes, okay. James Van Praagh: Everybody who passes out of the physical body, they all attend their own funerals, their own memorial services, always. It seems like the men will often be aware of who’s paying what. I’ve been through funerals, or wakes, I should say, where they’ve actually looked at their body and they’d say, “Oh my, that darn makeup I’m in makes me look like a sissy. Why am I wearing that makeup? Why’d they put that on me?” The woman might say, “Oh, why’d they put me in that darn dress? I hated that dress while I was alive, and now they put me in that in the casket.” I have that happen a lot. Bob Olson, Afterlife TV: Yes. The habit? James Van Praagh: I’m very sacrilegious. Don’t mean to offend anybody. But it was funny because, oh my gosh, it was like 40 years this lady was dead, and I’m talking to her. As I’m speaking with her I’m thinking, I can’t believe she’s still around. Is she still around? As I’m speaking to her, my father comes behind me in a spirit form, and he said, “Thanks for putting my teeth in. I look pretty good.” We were just two hours earlier looking down at his body saying, “Wow, we put his teeth in. We’re glad because he really looks great.” How often people do that, look down at the body and say, oh, they look really good now. It’s just so sick. It’s like, ooh. Bob Olson, Afterlife TV: Now, that’s amazing. A lot of mediums say they have trouble connecting with their loved ones in spirit soon after their passing. You were able to do that with your dad. James Van Praagh: Not to fight over the house. James Van Praagh: He said, “Don’t fight over the house.” Now, we decide, no, we will not fight over your house. Once I let him know we’ll not fight over the house, you have our promise—we won’t fight over a house; do not worry—he left. He left three hours before 12:00. The doctor was shocked. Now when he was communicating with me, he was communicating with me above his head. The energy of my father was outside his body, and it was above his head area. I find that most people who are in comas, in dementia, they step out of the body. They’re usually out of the body, very close to the body, still attached to the body, but also right over the body or aside to the body. That’s very, very true. Many people witness a sense of vapor in the final exit, feel the vapor rising out of the body, and they’ll see that. That’s the spirit leaving the body. A lot of people have experienced that. My father immediately said to me, “Oh my gosh; you got it right.” Now, my father was a born skeptic, a cynic, a skeptic, didn’t believe in what I did. He didn’t know what it was, but he certainly didn’t believe in it. He watched me on television every single day. He was very proud of me but didn’t necessarily believe in it. I don’t know what his belief system was, but as soon as he passed out of that body and to the other side of life, one of the first things he said within 20 minutes of his passing was, “Oh my gosh. You got it right. I’m alive. I’ve seen your mother. She gave me a brand new, tan suit, and I have a bunch of new shoes. Oh my goodness! I met a sister I didn’t even know I had.” We did research and found out that his mother had a miscarriage in her 40s. Bob Olson, Afterlife TV: Oh my God, that’s amazing. James Van Praagh: It was amazing. For three days after that I was like doing automatic writing, writing things down from him that he was discovering on the other side. He was that type of person, very much a detective trying to figure things out. He was giving me all this information, and I have a file full of the things he talked about, who he met when he first passed over, what the conditions were like when he passed over, the atmosphere, how he felt like the earth was quicksand. Bob Olson, Afterlife TV: Oh wow. That’s fascinating. James Van Praagh: So very interesting. Bob Olson, Afterlife TV: That really is interesting stuff. Boy! Someday you’re going to put that in the book, all that stuff? James Van Praagh: Maybe one day. Bob Olson, Afterlife TV: Yeah, it’s very cool. Now, when you say this, I just want to say before we move on, even though you have this great experience where you can communicate with your dad, I think some people are under the misperception that mediums don’t grieve because they have this ability to communicate with the spirit. You still grieved his physical loss, his companionship, those sorts of things, did you not? James Van Praagh: Of course, because I’m a human being. As human beings we have to go through that grief process. I did very, very much so. I’m more aware, so I know that he lives on, that there’s no death, that he’s just changed form. But it’s that physical part that you miss, and every human being has that. You miss the physicality of it. At the same time, saying that, I’m very, very happy where he’s at right now. I remember my mother when she was passing. She had a stroke, and she was an invalid for 10 years in a bed, couldn’t walk, eat, couldn’t speak. I used to pray that she would leave the body. I said, please, please let her go, let her go. She could only go when it was destined for her to go. When it was her time for her to leave, she went. I could’ve done the best I could with prayer, but you know what? I do believe we come in at a certain time, and we leave at a certain time. That, I think, is predestined. Bob, this might sound weird. Even when someone is killed, I do sometimes think that’s predestined. Do I think someone’s freewill is involved sometimes? Yes, I do. I think it could be either one. I think if someone goes to an ATM machine and some guy decides to hold them up and shoot them right there, and that wasn’t in the plans, that was not, as you say, in the cards, that now they’ve created what’s called karma because you interrupted that person’s destiny. Now you have set up a karmic condition with that other person. You’ll have to live through it another time. So I do believe there’s a time to be born and a time to die, but I do believe sometimes someone else’s freewill impinged upon your freewill. 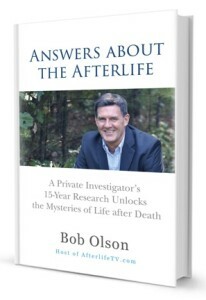 Bob Olson, Afterlife TV: Interesting. Well, with that said, I think the next question, because I’ve heard a lot of similarities in messages that come through; when someone immediately crosses over and they’re trying to contact their loved ones here, there’s usually certainly things that they want to say. What are some of the most common messages that tend to come through you as a medium that teaches you that this is what they want their loved ones here on the physical plane to know? James Van Praagh: Right, good question, first of all, very good question. They want us to know, number one, they survived death. There is no death. They’re not dead. I’m not dead, I’m not dead, I’m not dead. They want them to know that they will go to that person all the time right after they die, and they’ll go, “I’m not dead.” They’ll try to whisper at them. They’ll try to shove them, push them. They’ll try anything they can to let them know they’re still alive. Very, very much like the movie Ghost, where Patrick Swayze was trying to get through to Demi Moore. I’m still alive. I’m still alive. He was trying any ways he could to get it through to her that he was alive. Now, it’s so funny because like a bull in a china shop, sometimes they try so hard. But it does seem that it’s a very subtle, subtle energy. It’s the subtle things, whether it’s a whisper, whether it’s blowing on them, whether it’s a scent; they can project a scent, whether it’s a song they hear. These are the subtle ways that spirits get through to their loved ones to let them know that they’re fine. They, number one, want to let them know that they’re fine, that there’s no death, that they’re very alive. The other thing I find a lot is they want that person to move on with their life because there are some important things going on for that other person and they have to get involved in life. If they spend a lot of their time grieving this person, the other person is not going to be involved in their life, and they might miss out on certain opportunities. Bob Olson, Afterlife TV: Sure, sure. Well, that’s interesting. How about like, I know a lot of people wonder if it’s okay for them to remarry. I mean, have you ever heard anybody say no? James Van Praagh: I have had experiences where a husband or a wife passed over. I’ve had so many of these where the husband will come through to his wife and say: You know, I’m going to help you find a new mate. The wife would say: No way, I wouldn’t want to. He’s the only one in my life I ever want to be married to. I’ll never find anybody as good as him. That’ll never happen. Five years later they come up to me at some event and say, “You know, you brought through my husband and he said I’m going to find somebody. Well, this is my new husband. I want to introduce you to him.” It seems that spirits want the best for us, whatever that might be. They want the best for us. They will do the best they can. Just because two souls have come together for that many years doesn’t mean that they’ll spend eternity together. They don’t have to. A lot of people looking at this are very happy I just told them that. Bob Olson, Afterlife TV: No, I’ve always known that Melissa will be at a higher vibrating and a higher frequency than me. There’s no question in my mind about that. James Van Praagh: Oh Bob, come on, really? Bob Olson, Afterlife TV: Well, she does it here, so I assume she’s going to do it there. How soon after someone’s passing typically will they attempt these after death communications? James Van Praagh: It’s a very good question, and the answer I can give you is not an easy one because I’ve had both situations. Usually I answer it this way by saying, depending on the type of death, the situation that happened, the conditions of the death, whether it be someone who the prana, the energy of life, was dragged out, pulled out of them through the illness like cancer or AIDS or something that really debilitated the body, really pulled the energy; there was no energy left for that soul. It seems to me that there would a tendency for that spirit to have a longer adjustment period or a period where they have to recharge, if you will, to bring back the prana, the energy of life. Many of those souls have told me that when they pass over to the other side there’s a sort of a hospital. Not a hospital like we would know, but one of the spirit, one where they rejuvenate, recharge that energy, that prana of life, and bring them back to completeness, to wholeness. Earth time could be several months, yeah? I also, though, have done a reading for somebody. It was a gentleman, and this is many, many years ago. His partner had passed over on a Thursday of HIV. He passed over on a Thursday. This was a Saturday night, and he came through and talked about the lighting on the sidewalk in front of their house that they were just redoing the week before. They couldn’t get two of the bulbs to work. Sure enough, he said, “That just happened last week, and he just died this past Thursday.” So he came through like that. So it all depends. I mean if someone passed away with a heart attack, it’s much easier and faster to come through than someone that died of a long illness. It’s different. It’s all different. So I don’t think there’s any one way, but I’ll just tell you the tendency is depending on the conditions of the death. Bob Olson, Afterlife TV: Yeah. I hear a lot of people in this field, especially mediums, talk about waiting a certain amount of time before you go see a medium. One reason could be that, but the other reason probably has more to do with the person’s grief, their level of grief. Would you agree with that or what? James Van Praagh: Parts of it. I tell people, listen, you want to come see me, there’s got to be like a three-month wait. Because I believe that even though the spirit might have passed quickly, maybe it was very fast and they’re okay, I want to respect that spirit enough to give them an adjustment period to acclimate themselves to the new conditions of life that they have now. I feel bad about pulling them back down to this dimension, down to this three-dimensional heavy world where they have to deal with this heavy earth energy in this dimension. I want them to be very prepared, very adjusted, very acclimated to the new conditions that they have in that life before they come back here. For me, personally, I think it’s out of respect to the spirit. As far as the living person goes, I think that they have to realize that there is an adjustment period for the living and the dead, that for themselves as well it may be a grieving period. It’s also harder because when that person just passes over, the ones left behind are in that heavy grief, heavy, heavy, heavy, heavy, heavy grief. So you think about the spirit and how it has to come back and deal with the heaviness of the earth and the density of this dimension, but then also having to deal with the heaviness of the grief affecting their loved one, not too pretty for those spirits. So it’s very, very difficult. I agree with that. I think it’s respectful for a wait, a little adjustment period. I do. Bob Olson, Afterlife TV: That’s neat. What I love about that is you’re just treating them like people. You’re just treating them like you would treat anybody here, someone that’s been through something traumatic, something major in their lives; give them some time to get over that. This is where it gets a little confusing. Even though there’s no time or space or whatever up there, that’s I think why you probably used the word the “adjustment period.” You’re not really inferring time, but maybe whatever they’re dealing with in terms of time is what we would experience as linear time, right? James Van Praagh: Right. You have to realize that there’s a certain mindset that they’re also dealing with. So for instance, if somebody passes over with a drug addiction and with an overdose, that mindset is still very, very real because those memories are very, very real. They’re now in a world, in a dimension, where those thoughts are real things. Those addictions continue on, so in their mind they’ll still think of the addiction. They’ll still think of that way, that mindset of being. Even if it’s a depression, they’ll still have that because that’s who they think they are. It might take a little bit for them to realize, whether it’s through their guides and elders or family members that have passed over, to help them to realize the new world that they’re in, the new space that they’re in, the new mindset that they’re in where they no longer need drugs. They no longer need those physical things that make up who they think they are or who they were. So they’re beyond that. But it’s so funny because many, many times I’ve brought through spirits who still hold on to those addictions, whether it’s alcohol or drugs or money, whatever it might be. Many of them think that’s their life; that’s real. So there is an adjustment period. There is a period to acclimate yourself to the higher forms of life, the higher ways of life, not the earthly things. Bob Olson, Afterlife TV: Yeah, okay. Well, it’s interesting. In saying that, again, the subject here, are your loved ones in spirit trying to tell you something, do they try to tell you things about like fix the washing machine or pay the rent? James Van Praagh: Oh sure. Bob Olson, Afterlife TV: Do they? It’s fascinating to me that they would be so concerned about these very physical things. James Van Praagh: It’s very interesting. One of the messages I get through sometimes, I used to say I must have a guide who was a mechanic because I would get through all this information sometimes about bearings in wheels and electronics, and I don’t know a thing about cars. It’s like this wire here; you’ve got to redo this wire here. Sure enough, the father who comes through was a mechanic, or he loved cars and he would talk about that. Or many times, let’s say, a husband comes through for his wife, and they’ll discuss fixing the roof or that hole in the roof or there’s a part in the floor where it just goes down and he was trying to fix that before he died. They’ll look out for us. They’ll continue looking out for us. Just because they left the body doesn’t mean they don’t still have the same concerns that they had on the earth. They still have the same exact concerns that they had here. Because they love us so much, they’re going to look out for us with these things. I’ve also got to tell you that people, whether it’s the skeptics or certain people who don’t believe, they say, mediums bring through these inane, stupid details about things. Well, you know what? If I know that the spirit comes through and said, you know what? You just changed my picture frame from this little black frame to this ornate thing with hearts all around it. That might sound very trivial, but the person that did that, that’s pretty specific and no one would know that. So those little things actually add up to a lot. Bob Olson, Afterlife TV: I certainly have found it seems like the most mundane but specific things that are the most profound when someone’s getting a reading. That’s really what can cross them over that threshold of skepticism to really even a knowing, not just a believing but a knowing. There’s no way that this stranger could possibly have known this. James Van Praagh: Listen, I remember one of the ones, Bob, that blew me away, and I always get blown away by this stuff too because it’s brand new to me as well. When a son came through and spoke to his mother and has projected into my mind’s eye the house, and I’m walking through this house like a tour. I went into the living room. I turned to the right, and on the refrigerator is a pad. He actually gave me what was written on that pad. I told it to the mother, and she said, “Oh my God. Yes, those are the words. That’s the phrase that is on that pad. I just wrote it this morning on that pad.” Now, again, someone might think that’s mundane, but that’s pretty specific. That’s pretty amazing. Bob Olson, Afterlife TV: Yeah, to me, I mean that’s what it’s all about because if anybody is dealing with any level of skepticism at all, they’re looking for evidence. That’s evidence. That’s what we want. Then once you’ve delivered evidence like that, again, and I love it because they always use the same phrase: He couldn’t have known that; he told me things he couldn’t have known. When you bring forth that kind of evidence, then when you bring through the more vague messages like I love you, I forgive you, those kinds of messages, it’s okay because now we know that you’re communicating with our loved one in spirit. James Van Praagh: That’s right. We’ve established the validation. We’ve established the truth. We’ve established that this is them communicating for sure. It’s funny you talk about skepticism. Bob Olson, Afterlife TV: Yeah, well, it is, isn’t it, because that is something that I think of as one of the things that get in the way of us recognizing the communications from our loved ones in spirit. I mean I think that when we’re talking about after death communications that are not coming through a medium but just trying to come through us, like you said, through smells or even through dreams; I mean if we’ve had a dream visitation where you’ve had this really vivid dream and they came to us and we wake up in the morning, someone with a lot of skepticism, and I know because I was there, would just write it off and not gain from the amazing benefit that that can bring to comfort our grief. So what role does skepticism play in not being able to recognize these after death communications? It’s huge, isn’t it? James Van Praagh: It’s huge because you’re actually blocking the energy from happening. Yeah, I just recently did a television show called Beyond Belief and I did it for the Nightline people. Well, I only did it because the producer promised me that they would show things exactly as they appeared. Well, stupid me, duh, it didn’t happen that way because they have their agenda. So I would never do a television show again where they can edit it. I will only do live television shows. Because we filmed for 12 hours and the information that came through, they didn’t show it, did not even show it. But they create it the way they want to create it. They made it a skeptical, cynical point of view. It’s a shame because television and so forth, it’s the greatest teacher we have. I think the skepticism comes a lot from fear. I think it’s fear based. I was a skeptic for a long time, and I’m not anymore because there came a point where I had to acknowledge what was coming through. But I find a lot of people who are skeptics are fearful of the unknown. They’re fearful of things. A lot of people, I feel too, if they realize that this is real, that these things are real, wow, they’ve got to rethink their whole world. It changes their paradigm, and many people don’t want to change their paradigm. They’re so happy to be in that little comfort zone that anything that’s challenging or threatening to that paradigm that they’ve already set up they don’t want to deal with it, especially when I bring through and other people bring through that you as a human being are responsible for your thoughts, your words, your deeds. What you give out you are responsible for. When you pass over there’s a life review, and you’re going to review all the good, the bad, and the indifferent things that you did. A lot of these people don’t want to go near that, so it’s easier for them instead of taking responsibility to negate things, to negate the truth of certain things and be cynics and skeptics about it. Bob Olson, Afterlife TV: Well, you’re right. I know that my own skepticism was based on a fear of being ripped off and a fear of being made the fool. I wrote an article once and I got thinking back, like no wonder I feared being made the fool when you think about Santa Claus and the Easter bunny and the Tooth Fairy. All of the sudden you’re going to school talking about you just got a dollar from the Tooth Fairy, and half the kids are laughing at you because they found out long before you did. You go through this humiliation as a child, and eventually if that happens enough or if it’s traumatic enough you become what I was, this skeptic who was like I am never going to be made the fool again. James Van Praagh: I’m never going to trust. Bob Olson, Afterlife TV: Who was telling me about these things? The people I trusted the most in life, my parents. They’re the ones who lied to me, so if they’re going to lie to me, I can’t trust anybody anymore, right? James Van Praagh: Exactly, exactly. Bob Olson, Afterlife TV: Then what happens is exactly what you said. Then what happens is we grow up to be adults and we have these fears. We start to explore spirituality. We might explore the afterlife, mediumship. Then we watch a television show where it’s this unbiased journalism, and we think, oh well, the media, we’ve got to trust the media. James Van Praagh: We’ve got to trust the media. Oh yeah, got to trust the media for sure. James Van Praagh: Bob, let me interrupt. If I let the cameraman and the soundman talk about it, it’d be a whole different show because they know what they saw. So it really burns you when you work really hard with spirit and then the people in the audience are getting ripped off too. Bob Olson, Afterlife TV: Oh yeah, there you go. James Van Praagh: That was just completely out of context. Bob Olson, Afterlife TV: Yeah, it gets distorted. James Van Praagh: You can’t trust them. You can’t trust them. That’s sad. Bob Olson, Afterlife TV: So that’s when they’re videotaping. They’re filming stuff. They can edit it. But then articles that are in the magazines and newspapers, it’s the same thing. Now they interview you. Now they pretty much write up whatever they want. Talk about editing. It’s the same thing. Some of them do a great job, and they’re very unbiased. They show the evidence, but then they’ll also maybe bring a skeptic in to hear his thoughts. That’s fine. James Van Praagh: That’s fine. I’m great with that. Everything is fair, objective, great. I went to broadcasting school. I have a degree in broadcasting. I remember it was very, very pushed into our heads, you must be objective; you must be objective; you cannot be biased. It was almost like a law about this when you go into broadcasting. Now I see it and it’s like everything’s all over the place with reality television. They just do what they want to do, and they just like create these things which aren’t even there. So it’s sad. Bob Olson, Afterlife TV: Yeah. It’s sad for the public. It’s sad for the people who are grieving who could be really comforted by evidence of the afterlife. James Van Praagh: Exactly, if it helped instead of hurt. Bob Olson, Afterlife TV: Yeah, and it stops them in their path. So they see something like that, and it stops them in their path. They don’t even investigate further because they believe what they saw. Now, at the same time we talk about this, so these are some of the things that create skepticism and keep our skepticism going. I think that the field itself, the psychic and medium field itself, is partly to blame. What do you think? I mean, don’t you think there are areas that we can sort of up the standards a little bit? James Van Praagh: You think? Bob Olson, Afterlife TV: Where do we start, right? James Van Praagh: Listen, I used to go around the country, and I used to go to different places where they have mediumship. I was appalled at the level of quality of mediumship which they called mediumship. I was appalled because I’d think like, this is not mediumship. It’s general questions. This is not what mediumship is. You have people’s lives in your hands, and you have to be sensitive to that. It’s like being a doctor. You’ve got to be really careful and sensitive to the people you’re working with. I have found a lot of these people, organizations, not all of them but some of them, are very low, low level quality. That’s not right. That’s not right. Bob Olson, Afterlife TV: No. Now, what are some of the either professional or ethical standards that you think every medium should sort of live by or work by? James Van Praagh: Number one, if they’re going to go into the profession of mediumship, they need to learn what mediumship is about. Hello? I would not operate on somebody unless I had gone to medical school. They need to learn how to properly develop, whether that’s two years of working with energy, two years of psychic protection, two years of discerning between the spirits’ information, spirit energy, and of your information. That’s very, very important. Values and integrity are right up there. Dealing with people, sensitivity to people, very important. You have to be able to put the time aside to develop properly, be patient about it. Nowadays people think you just take a pill and you’re over something. You’re done. Not true of mediumship, it is a process, process, process. Really, if people take a psychic class, they’ve done this with me, and they do a great job reading somebody, so it’s like psychism. Then they go on and start doing readings for people. I’m like, wait a minute. You’re not ready yet. You’re raw. You’re not cooked. It’s a shame, and I stopped teaching for many, many years because of that. Then the spirit said to me, well, it’s not up to you, James; it’s up to that individual. But that’s really what it’s about. If anyone wanted a reading and they’re looking at how do you get a reading—I know you talk about this a lot and you work with this a lot in your work—number one, go with someone who’s referred to you. That’s why on your site it’s great having those referrals. Of course, I’m not on that page. I don’t know why. James Van Praagh: I’m joking, I’m joking. Bob Olson, Afterlife TV: You are, actually. You’re coming up very soon. I’m finishing the article. I had to wait. Just so the public knows, I don’t add anybody to my personal recommend list unless I’ve had a reading from them or actually seen them live. I had never seen you live before, and when I did I was blown away. James Van Praagh: It’s a pretty funny story. It was in Massachusetts, and I was at Newburyport, right? Bob Olson, Afterlife TV: Well, first of all, I have to say, you gave a reading that night and a little girl came through. To this day—I’m not blowing smoke—it was the best reading I have ever seen, especially from stage but even a private reading. The details that that little girl conveyed to you were absolutely amazing: how her hair was done for her burial, what dress she was wearing, something that was snuck into the coffin by one of the relatives, a favorite T-shirt of hers and what it said on there. I mean it just went on and on and on. It was an amazing reading. James Van Praagh: I don’t remember it. Thank you because I don’t remember them. Bob Olson, Afterlife TV: Aw, I wish it was recorded. It was going so well that I think it had to go on for 15 minutes at least. It was just absolutely brilliant, and I was blown away that night and very excited about it. But it’s that kind of mediumship that I want people to be able to experience. You have a lot of people on www.vanpraagh.com that you recommend as well on your own website. James Van Praagh: That’s right. I’m like you in that you have to really test people. I go through three levels of testing for anyone I have on my site. I’ve met many people who say, “I should be on your site. I’ve been doing this 20 years.” I’m like, “Well, then you have to give me a reading. You have to give two other people readings.” Some people refuse to. They say, oh, I’m better than that. Well, then fine, bye-bye. I won’t let them on. Bob Olson, Afterlife TV: Well, that’s it. It’s not how long they’ve been doing it because there are people have been giving readings for 20 years but they give two readings a week on the weekend part time. Then you’ve got other people who are giving 10 readings a week, and they don’t have the same experience. Twenty years at 10 readings a week, 20 years at two a month, they just don’t compare. James Van Praagh: Yeah, very true. Bob Olson, Afterlife TV: So people shouldn’t be fooled by how long someone has been in there. Well, just to wrap up a little, going back to our loved ones trying to communicate with us in spirit, some of the things that people can do on their own. Obviously, we can go see a medium, and it’s important that they choose a credible and experienced one. But what are some of the things that you might recommend that people can try to do to sort of maybe connect on their own? James Van Praagh: Sure. One technique which works very, very well is I tell the person to go in a quiet space, write a letter to your loved one. Write a letter to your loved one, and put everything out on that piece of paper. Everything that’s in your heart, just lay it out there. Fold up the letter, put it in an envelope. Put their name on it, and put it in a drawer somewhere. Then mark on your calendar two weeks later to come back at a certain time. Sit down and get another piece of paper. Now I want you to write from their point of view, from the spirit coming through to you. Just open up your mind and let them write. Start writing a message from them to you. It works every time. Bob Olson, Afterlife TV: Oh, that’s beautiful. James Van Praagh: Another way they can do, because you don’t need a medium, you can be a medium yourself really. Before you go to sleep at night, you can ask them to appear in your dream state. Say, please come in my dream state. It might not happen that night. It might not happen for a week. It might not happen for a month, but it will happen. But just put it out there. Don’t try to control it. Just put it out there, and let it be. The third thing I would say is to start meditation. Go within and begin to meditate. Quiet the mind down. Because as spirits come through to you, they come through in very subtle signs, very subtle whispers, very subtle ways, methods; so you want to be able to be in that space of sensitivity in order to be able to hear them and feel them and even see them. So the more you meditate, the more you sensitize yourself, the easier it will be to receive. Bob Olson, Afterlife TV: Well, I mean that’s beautiful. A couple questions about that. First of all, you talked about dreams. I’ve heard people say, you know, my loved one came to my sister in a dream but hasn’t come to me. They’re upset about that. Why might something like that happen? James Van Praagh: Because we have to remember that we’re all electromagnetic energy; we’re all made up this way electrically. What we think is created. There are some people who try too hard. They try way too hard. Oh Johnny, come through to me, come through to me, come through to me, come through to me. They’re trying so hard that actually what it does is blocks. It blocks the atmosphere around the mind. It’ll block it, so they can’t get through as easily. But the sister who’s not even thinking about it, they can get through easily that way. It’s the same thing in an audience. When I have an audience, inevitably I say to the audience, if I have a husband and wife here, the message will always be given to the husband who didn’t believe in this and that was dragged here by the wife. He’ll always get the message, someone coming through to him. Why is that? He doesn’t even believe in this sort of thing. That’s just it. He’s not trying to control the situation. He’s not trying to push the energy or pull the energy toward him. He’s being very neutral, so it’s easier for a spirit to get through. So that’s really what you want to do is you want to be very, very neutral. Bob Olson, Afterlife TV: Oh, interesting. So there’s a big difference between needing and wanting a message from someone. There are different energies apparently from that, and surrendering, just surrendering. James Van Praagh: Surrender, great one, surrendering. Bob Olson, Afterlife TV: Yeah, that’s great. So meditation, I mean has anybody ever created a habit of meditation and then all of the sudden found they started maybe hearing loved ones communicating to them? I was thinking more on the [laughter] all right. So is that—? James Van Praagh: Well, I teach my classes a meditation every day. Because even in my work when I first started doing this work and I didn’t even know I could see a spirit or hear a spirit until I started meditating, the more I meditated the more—and this is informal meditation, I didn’t know anything about it—once I started meditating, quieting down the mind, the chatter, I started seeing and hearing and becoming much more sensitive to that energy that was around me. But the more someone meditates, the easier it is to see and hear them and be sensitive to them for sure. A secret in meditation which a lot of people don’t know is a lot of people hesitate in meditating because they think, oh, that chatter in my mind, I’m not going to be able to turn it off. I’m not going to be able to turn it off. Fine. What you want to do is this: When you sit down and you’re ready to meditate, make sure it’s in a space which is quiet, if you can, from the outside noises, and give yourself that time. Turn off phones and all the rest of it. You want to be open and surrender, like you say, surrender, to what you receive. It’s normal for you to sit there and think, okay, mmm, what am I going to have for food tonight? Oh boy, I wish that neighbor would stop mowing their lawn. Oh boy, that dog is barking. Normal, normal things. What happens is if you realize that you’re going to have those chattering, that you will hear that noise, don’t judge it. Just let it be okay. It’s like being on a lake in a boat, you’re going to hit a rock or you’re going to hit a certain current. Fine, you’re still going to float. If you take away judgment and you neutralize it, you’ll go deeper. This is true not only of meditation but of life: When you don’t judge something, you’re not putting energy on it. So you can have the dog barking. Okay, acknowledge dog is barking. That’s fine. Then move on. Okay, I hear that. That’s okay, moving on, no problem. Don’t judge it. Don’t sit and think, oh, I wish it would stop. Just realize that’s the way it is. Whenever I do meditation in seminars, I’ll always start off the group saying, okay, breathe in, breathe out. You might hear the sound of my voice. You’ll be hearing that. You’ll hear the music behind and the outside noises; like a kitchen is behind them in the hotel and they’re throwing around the dishes. The outside noises don’t distract you, just make you go deeper. That’s okay. It makes you go further and further and brings you right back to center. It brings you right back to center. It works. As long as you don’t put the judgment on it, it works. Bob Olson, Afterlife TV: That’s great. I know you have an online course where people can learn about meditation on there. James Van Praagh: Several, Bob. Bob Olson, Afterlife TV: This is on your website vanpraagh.com. You also have at least one book. I mean I know you have a book on meditation. You do. How many books do you have actually? James Van Praagh: I have a book solely on meditation. It’s called Meditations. It’s called Meditations, Bob. Bob Olson, Afterlife TV: That was a good title. But no, I think it’s important. James Van Praagh: I have a book on meditations. Bob Olson, Afterlife TV: I think it’s important. James Van Praagh: It’s a good book. It’s a great one. Bob Olson, Afterlife TV: Do you sell audio of guided meditations or anything like that? James Van Praagh: Yes, yes, on my website and the store page. Bob Olson, Afterlife TV: Okay, because that’s a good way to start, is it not? James Van Praagh: Yeah, yeah, yeah. The best way is through meditation for sure, definitely. Yeah, that’s the way to start is through meditation and getting into the habit of that, the discipline of that. Bob Olson, Afterlife TV: But I mean even with guided meditation, because to me it’s a lot easier if I’m listening to someone guide me through meditation. Do you recommend that over—? James Van Praagh: Yes. Well, yeah, very much so. Some people need that guidance. Some people need someone else to help them, walk them through it, which is fine. I do that in my meditations. I do that with people. It does help them because it alleviates them trying to control it and it lets them have the space to go off and have their own journey. They can get out of that left brain. They just completely surrender to the right brain, so they receive the information even that much more. So yeah, guided meditation, I think, is definitely the best, no doubt about it, and I have them on my website. Bob Olson, Afterlife TV: Okay, that’s great. Again, www.vanpraagh.com. James Van Praagh: It’s a hard name. That’s a very difficult name. It’s karmic. I think I did something in a past life to deserve this, being that it’s misspelled all the time. Bob Olson, Afterlife TV: I’m sure it is. Praagh, yeah, that’s a good one. Well, I think we’ve covered a lot of ground here, and I think it’s going to be very helpful to people. I do recommend that they go to your website just for the meditation stuff. There’s also an online course for intuition. I love the one about life after loss. What’s that course about? James Van Praagh: It’s based on my book Healing Grief, the third book I wrote. It’s really for anyone who is dealing with loss of all different types, not only death but loss of a job, loss of a marriage, loss of age, loss in itself. There are so many components, and people are affected by that in so many ways. It affects your stress level in so many ways. So the book and the online course about life after loss really have been beneficial for people going through those situations in life. So I would urge people to try that one as well. Bob Olson, Afterlife TV: Okay. James, thank you once again. I appreciate you coming back. It’s always a pleasure. I always learn so much myself, and I know the public is as well. So thank you so much. James Van Praagh: Any time, Bob. Thank you. Bob Olson, Afterlife TV: All right, James. Take care now. Bob Olson, Afterlife TV: Bye.